Rely on AQHI Inc. for safe and thorough asbestos ceiling removal in Hacienda Heights CA. 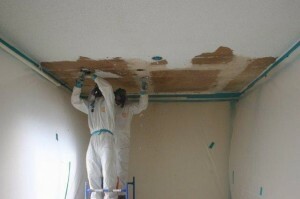 Get professional asbestos ceiling removal in Hacienda Heights CA from AQHI Inc.
Asbestos content: Being installed prior to the 1970s is a strong clue you might have asbestos in your acoustic ceiling materials. However, it is not solid proof that you need professional asbestos ceiling removal in Hacienda Heights CA. To be certain you have asbestos, we recommend investing in asbestos testing. Whenever you tackle a project involving asbestos, you need a certified contractor. This is especially true when asbestos ceiling removal in Hacienda Heights CA is involved. Normally, asbestos-containing materials are wetted down before removal work begins to help minimize fiber release. This is not possible with ceiling materials that have been painted. Asbestos ceiling materials also generate more airborne dust simply because of their location–any dust that is dislodged will immediately become airborne. AQHI Inc. is a true expert in safe asbestos removal, and we have the certifications to prove it. You can rely on our thoroughly trained employees to get your asbestos ceiling removal in Hacienda Heights CA done to a high standard in compliance with all relevant rules and regulations. At AQHI Inc., we truly care about the safety of your property. We guarantee that your asbestos removal will be done to a high standard and we can confirm this fact with asbestos air testing after the project is complete. Contact us now to learn more about our services and/or get a quote on asbestos ceiling removal in Hacienda Heights CA. Our asbestos removal office for Asbestos Ceiling Removal in Hacienda Heights CA is open Monday through Friday between 8:00 AM and 5:00 PM and closed for lunch from noon to 1:00 PM. With advance notice, projects can be scheduled for weekends, early mornings and evenings.